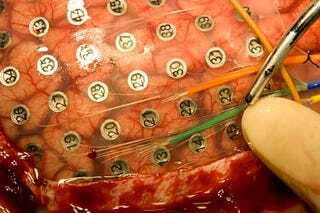 A microelectrode array sitting on top of a brain, that might help move toward neural interfaces allowing the paralyzed to control things with their thoughts. You're looking at ferrofluid, which is made up of magnetic fragments of iron suspended in oil. This huge laser at the Goddard Space Flight Center is shot across 250,000 miles of space, nailing the Lunar Reconnaissance Orbiter 28 times a second to measure its range. 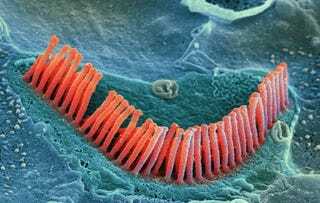 Inner ear hair cells at 21,000x magnification. Ewwww. The world's largest observation wheel, it's 580 feet tall. It's the largest single-cell super pressure balloon ever flown that can carry a 2000-pound piece of equipment more than 110,000 feet in the air. Tree frog embyros that look like jello. The volcanic storm spurred by the Chaitén volcano that erupted after a 9,000 year dormancy. 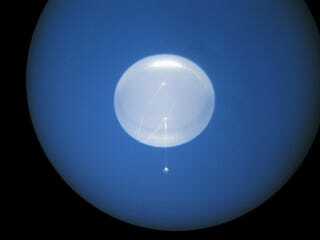 Drops of fluid balancing on an ultra-repellent surface, which is made up of 400 nanometer-wide silicon spikes.